People are always looking for ways to save money on tools, and one way is to cut down on the tools you need to own. So why buy a regular circular saw and a track saw, when you can use your circular saw as a track saw with the TrueTrac system? If you remember, I reviewed a system from Eureka Zone that also lets you turn your regular saw into a track saw, and at the time it was the only conversion option on the market. TrueTrac is a newer system that functions very similarly to the Eureka Zone system. In fact, it is so similar to the EZ system that one might call it a knock-off. 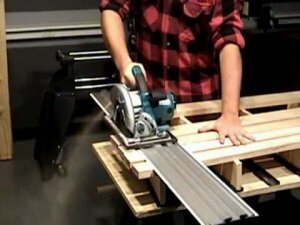 Both systems work by attaching a base onto the bottom of your circular saw and this base will ride on its respective track. The base and track designs are a bit different from both brands but the concept is the same. An anti-splinter edge aligns the track to your cut line with no need for blade offset measurements. Someone brought the TrueTrac track saw system to my attention and asked how it compares to the EZ track saw. I haven't used the TrueTrac system and I have used the EZ system so I do not think it would be fair for me to compare the two in great detail. If you are in the market for a track saw conversion system, you should definitely research the two. The TrueTrac does offer a lower price, but the EZ system offers more in a kit (ie. clamps), offers more accessories options, and has more years of research into it.